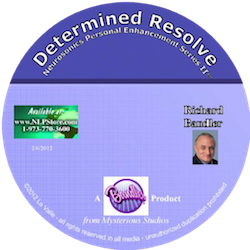 This set of 3 CD's addresses what Richard Bandler considers one of the main problems with human beings: The sheer lack of ecstasy in most areas of their lives. CD 1 - The Ecstasy Machine. Hypnotically install a strategy which continually adds more ecstasy to your life. CD 2 & 3- Spreading Ecstasy. Once you have some, learn how to pass some on to others. They'll like it, too. This set was recorded live and has some music overlaying the voices at times.